A patio provides you with a way to enjoy time outside with your family and friends. A number of building materials are available that you could use to build the patio, including bricks or paver stones, wood and concrete. Concrete is fairly cheap to use, and if poured correctly, can last for decades. When pouring a concrete slab against an existing wall, installing expansion strips between the patio and the wall can protect both structures from the effects of temperature changes on the concrete and the ground beneath it. Mark the outline of the patio onto the ground with spray paint. Dig a hole in the ground inside the lines you spray-painted. Depending on the size of the patio and the depth of your frost line, you may want to rent a 1 1/2-ton excavator to do the digging, although digging by hand near the wall can prevent damage to your home's foundation. Dig the hole deep enough to go beneath the frost line to protect the patio from suffering from upheaval caused by the ground freezing and thawing. This depth varies by region, with a depth of a few inches in the southern U.S., and several feet in the northern U.S.
Drive wooden stakes into the ground around the edges of the hole, using one stake every 3 feet. Nail 2-by-4 boards to the inside edges of the stakes. This is the wooden form for the top edge of the concrete. Cover the ground inside the hole with a vapor barrier, which is a plastic sheet that blocks moisture from damaging the foundation of the patio. Set expansion strips in the hole next to the wall. They act as a buffer between the patio and the wall when they expand and contract due to temperature changes. The expansion strips can be made from a variety of materials, including cork, plastic, fiber and sponge rubber, and must extend across the entire length of the joint where the patio and wall meet. Build the foundation for the patio by filling the bottom of the hole with sand or gravel and laying rebar or wire mesh on top. Follow local building codes regarding which materials to use and how deep you need to make the foundation. Fill the hole with concrete. You can mix the concrete yourself and pour it, but if you need more concrete than you can mix at one time, hire a concrete contractor to provide the concrete. Drag a 2-by-4 board across the top of the form to smooth the surface and remove any extra concrete. If there are any holes in the patio, add more concrete to them and smooth the form with the board again. Smooth the surface further by sliding a bull float across the concrete, holding the float with the back edge hanging in the air. Lower it to the surface when you reach the other side, and pull it back across the surface. Lay a plastic sheet over the patio while it cures. Lift the sheet up and spray water onto the concrete with a light mist once a day to keep it damp, then cover the patio with the sheet again. Do this every day for a week, then keep the concrete covered for another week as it cures. Lift the plastic sheet off of the patio. Remove the wooden form from around the edges of the patio, and fill in the gaps between the patio and lawn with dirt. 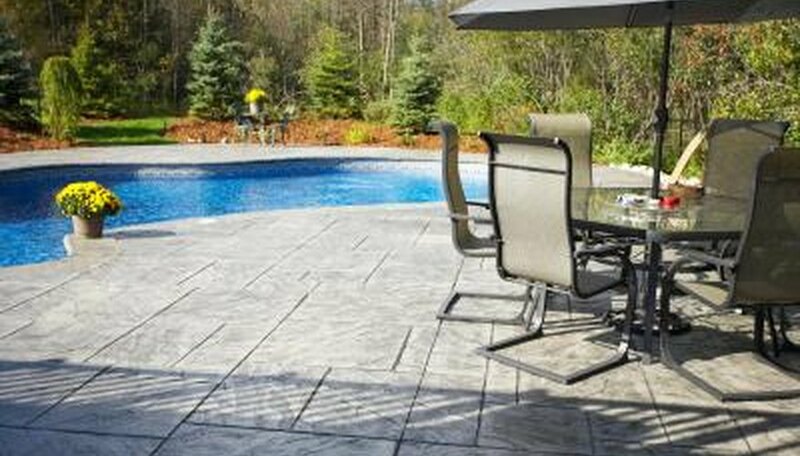 Contact your local zoning board before building the patio to acquire any needed permits and learn the building codes you must follow. When purchasing the expansion strips for use between the patio slab and the exterior wall, make sure that they are at least 1/4-inch wide and can withstand the climate in your region. Consult your local hardware or home improvement store for advice on which strips to buy. Get the utility lines in your yard marked by calling 811 before you dig the hole. You can be fined and held liable for repair costs if you damage any buried lines.